This is Moose, a wonderful Golden Retriever. Moose was born March 5, 1991. He is the son of Ch. Glenru's Rusty Nail CD (Rusty) and Ch. Stonehedge Ragweed Tapestry (Cotton). Moose is truly a beautiful golden retriever. 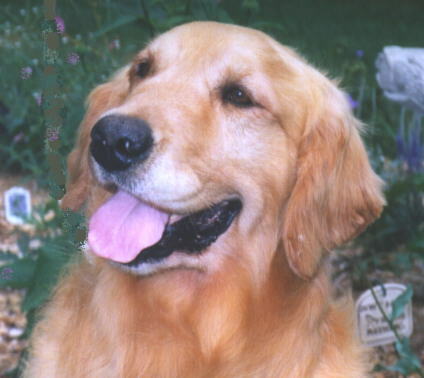 At the high end of the Golden Retriever breed standard, Moose stands 24-1/2" at the shoulders and is approximately 90 pounds. 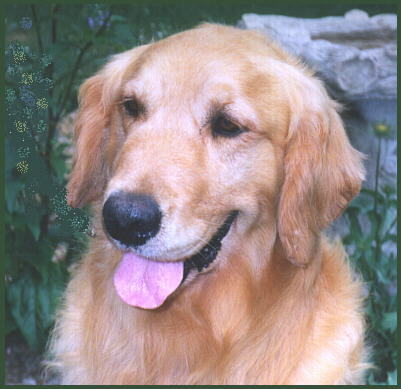 His coat is medium gold, and is long and dense with excellent thickness of undercoat. He carries full feathering and a lovely mane. Moose is a large boned and is an impressive golden retriever. Moose had a very successful show career, attaining his championship at a young age and going on to win multiple group placements. He has been retired from showing for several years now, preferring to stay home and have fun being a goofy golden retriever. The world is a wonderful place according to Moose. At 7-1/2 he is fun loving, energetic and loves to play, especially retrieving. He's a big Schmoozer and loves to cuddle. Very gentle and kind, he is a favourite with children. Moose has the perfect golden retriever temperament and life would never be the same without him.